When combined with a HORIBA Fluorometer the Quanta-Φ forms the most accurate, versatile and complete luminescence yield system available! Not just an integrating sphere – a complete quantum yield solution! 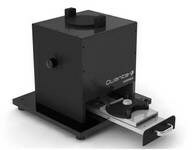 Quanta–Φ is a quantum yield and CIE measurement accessory for our Flurolog and FluoroMax fluorometers. Quanta–Φ features a large 150 mm (6 inch) integrating sphere, unique bottom-loading solid sample drawer, electrical connection port for EL measurements, all controlled from a simple-to-use dedicated QY/colorimetry software. Combined with our highest sensitivity and flexibility fluorometers, Quanta–Φ is finally the headache-free PL/EL QY solution you need. There are no threads in HORIBA Quanta-phi Reviews at this time.